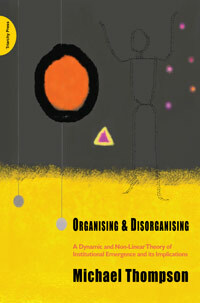 Michael Thompson argues that there are five ways of organising: hierarchical (e.g. Government), egalitarian (e.g. Friends of the Earth), individualistic (e.g. financial markets), fatalistic (nothing will make a difference) and autonomous (hermit-like avoidance of the other four). Leaders with “a job to do” often conclude that any interaction with an opposing approach is a messy and unwelcome distraction. Yet, through a wide range of examples, (UN EP, Shell, the World Bank and Arsenal Football Club, to name a few) we are shown how each way distils certain elements of experience and wisdom that are missed by the others and that taking all the voices into account in the policy process means everyone gets more of what they do want and less of what they don’t. Michael Thompson calls these ‘clumsy solutions’. The lively style of the presentation - punctuated with the author's delightful wit and humour - and its rigorous attention to detail makes this book suitable for anyone who understands the importance of variety and diversity, and how it can be used to achieve 'best outcomes'. Its lively and witty presentation and its rigorous attention to detail makes it accessible to academics, managers, policy makers and the interested general public in search of sustainable solutions.